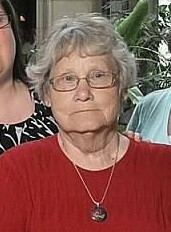 Virginia Lee Heitkamp, 80, formerly of Payne passed away Monday, April 1, 2019 at Signature Healthcare. Virginia was born in Celina on April 17, 1938, a daughter of the late Marcella (Buschor) and William Barth. Virginia was a dedicated wife, mother and grandmother. She worked at Golden Years Homestead, Meijer and McDonald's. She will be sadly missed by her children, Kim (the late Mark) Goodspeed, Ruth (Steve) Woods & David (Sonya); sisters, Patricia (the late Ned), Dorothy (the late Warren) Musser; half sisters, Judy Williams & Susan Sayers; 5 grandchildren & 2 great grandchildren. A Mass of Christian Burial will be celebrated at 10:30 am on Monday, April 8th at Divine Mercy Catholic Church in Payne. Viewing is Sunday, 2 - 5 pm & Monday, 9:30 - 10:00 am at Dooley Funeral Home, 5761 SR 500, Payne, Ohio. Memorials are to Divine Mercy Catholic Church or Parkview Hospice. FLOWERS AND OTHER TRIBUTES MAY BE DELIVERED SATURDAY, 9 AM TO 3 PM AND SUNDAY, 9 AM TO NOON.